Ryan Bingham had played music for a few years when he met Terry Allen, a well-known songwriter and artist. As fate would have it, Allen and his wife, Jo Harvey Allen, were hosting their 44th wedding anniversary party in Marfa, Texas, and Bingham was invited to join in the celebration. From accounts I’ve read, the weekend of July 7, 2006, must have been a raucous time in Marfa, as the Allens were joined for the weekend by a who’s who of Texas musicians, such as Guy Clark, Joe Ely, Butch Hancock, Robert Earl Keen, plus David Byrne, and many others. That Friday and Saturday, the musicians performed at Joe’s Place, a local bar, and the funds raised went to the town clinic. That $10 charge must have been a bargain to see several Texas music legends perform, and Ryan Bingham “held his own,” earning praise from the more experienced performers, some of whom became mentors. The next year, Bingham released Mescalito in October 2007, and Terry Allen played on one of the tracks. The first track on that album was “Southside of Heaven”, a melancholy tale of hard living, which Bingham says was the first song he ever wrote. The music video, directed by Anna Axster, features fittingly sepia-toned images of four lone travelers on distinct journeys across the American Southwest, with the characters played by Bingham and his Dead Horse band members, Corby Schaub, Matthew Smith and Jeb Stuart. The video for “Southside of Heaven” was filmed in the towns of Marfa and Valentine, Texas. If you have any tips on locations that I missed, please contact me through the Grahm's Guide Facebook page. The video features four men on separate journeys in the Southwest. Throughout, Ryan is shown singing on the front porch of the HiWay Café. The dilapidated HiWay Cafe location is along California Avenue, Valentine, TX 79854. Reference: In this case, I was familiar with the filming location before I ever knew anything had been filmed there. I was able to confirm it through a post on Ryan Bingham's Facebook page. The hitchhiker is seen along this road in "Southside of Heaven"
The hitchhiker is seen catching a ride from this parking lot in "Southside of Heaven"
We see a lone hitchhiker walking along a road, past an abandoned gas station and collapsed buildings, until he catches a ride in an empty parking lot. The parking lot is also on California Avenue, Valentine, TX 79854. Reference: This was easy to locate because the building with the parking lot is next door to the HiWay Café. You can see the former gas station from the parking lot. The four traveling strangers find themselves at a bar called “Joe’s Place,” where they decided to join forces and head off into the sunset. 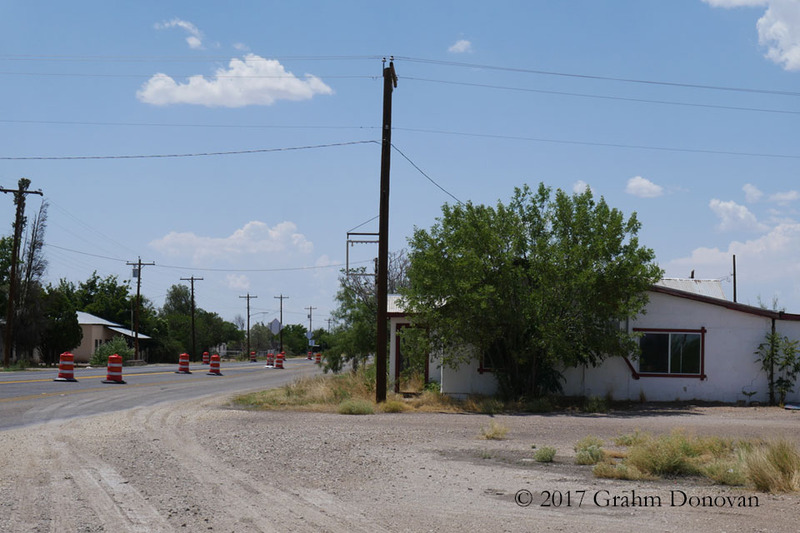 The bar is now officially known as the Lost Horse Saloon, 306 E San Antonio St, Marfa, TX 79843, but the Lost Horse has previously been known as Joe’s Place, and Lucy’s and Ray’s, according to Sterry Butcher, whose articles were a great source in pinning all of this down. Whatever it’s called, it is the same bar where Ryan Bingham made such an impression on those Texas music heavyweights back in 2006. Reference: Ryan Bingham confirmed this filming location on his Facebook page. In this world of A Million Little Pieces, I cynically wondered if there might be some embellishment to such stories, an inflated bit of promotion that had been designed to add an “authenticity” to the music. But, I was able to confirm via an e-mail to the American Junior Rodeo Association (AJRA) that Bingham had been a "member and competed in numerous events.” Sure enough, this guy was a real-deal rodeo bull rider. He's come a long way from that life. He married Anna Axster in Malibu, CA in 2009, in a wedding officiated by Terry Allen. Later in 2009, he appeared in the movie Crazy Heart, and his song "The Weary Kind (Theme from Crazy Heart)" won an Oscar at the 2010 Oscar ceremonies. Now, that's a wild ride. When you get to Marfa, stop by the Marfa Visitor Center for pointers on area activities. The visitor center is located in a historic USO building used during World War II, and the staff is top notch. Also, when you head to the area around Marfa and Fort Davis, be sure to check out the food blog Because Food is What I Do for tips on what to eat in the Big Bend area. I was fortunate to bump into this lovely author who uses her blog to share her food column from the Alpine Avalanche, along with local restaurant news and reviews and other food-related topics.